Indeed, there have been fine examples both locally and internationally of the private sector’s providing solutions for threatened historic properties. Did you know that Mount Vernon isn’t owned by the federal government? 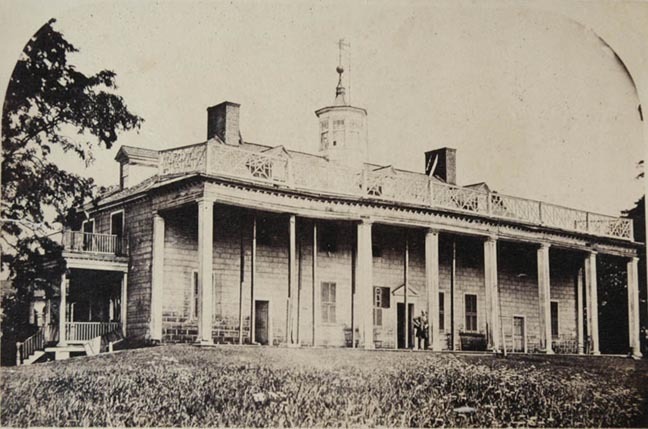 In 1853, Ann Pamela Cunningham formed the Mount Vernon Ladies’ Association to purchase George Washington’s family homestead and rescue it from decrepitude, thus launching the first major historic preservation project in the United States. The Association operates the home museum to this day. Closer to home, the Friends of Casa Feliz formed in 2000 to save Gamble Rogers’ masterwork, when consensus couldn’t be reached for the city to own the project. The Morse Foundation has painstakingly preserved Osceola Lodge, the 1883 Craftsman style home of city pioneer Charles Hosmer Morse, without city assistance. There have been more situations, however, where the private sector was unable or unwilling to intervene, resulting in serious threats to architectural heritage. In some cases, government has stepped into the breach. A classic example is Stonehenge—in the 1870s, the monument’s private owner, arguing that “it’s not the slightest use to anyone now,” attempted to sell it to a railway company, when the British government intervened by passing the Ancient Monuments Protection Act. When government doesn’t come to the rescue of a threatened architectural treasure, people almost invariably wish it had. 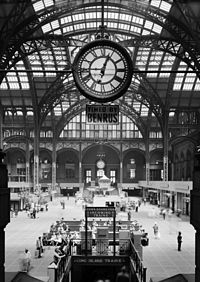 Following the 1963 demolition of New York’s Penn Station by the private Pennsylvania Railroad Company, public outcry was such that Congress would ultimately pass the National Historic Preservation Act, which empowered States and municipalities to develop plans to legally protect their historic inventory. Since the passage of the act in October 1966, cities that value their history have established strong historic preservation ordinances. An unrealistic threshold for district designation: In order for a historic district to be formed in the city, the ordinance requires that at least two-thirds of the homeowners in the proposed district vote in favor of its formation. Two districts have managed to get the votes to form districts—the College Quarter and Virginia Heights East. Others, though, have fallen short because of this threshold, which far exceeds the requirements of other Florida cities. West Palm Beach, for example, requires no threshold whatsoever for a neighborhood to be designated, nor should it, according to Friederike Mittner, the city’s historic preservation officer. “We don’t ask the homeowners’ permission for other zoning ordinances,” she said. “Historic preservation is just another form of zoning.” That city has 16 districts designated to date, protecting over 3,500 historic homes from demolition. Insufficient protection from demolition: If a historic home or building is voluntarily listed by its owner on the Winter Park Register of Historic Places, it’s difficult, though not impossible, for a future owner to receive permission to demolish it. 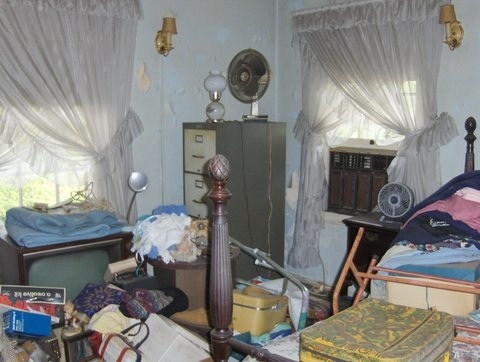 It’s a different story, however, for historic homes or buildings not lucky enough to be owned, or previously owned, by a preservation-minded person. 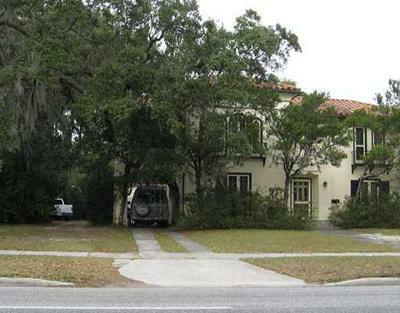 Specifically, there are about 700 Winter Park residential and commercial structures on the Florida Master Site File (the state’s official record of historic buildings), yet only about 25% of them are on the Winter Park Register or in a historic district, and thus shielded from demolition. Thus, if someone were to purchase Gamble Rogers’ Macalaster House,arguably one of the architect’s most acclaimed structures, and raze it, there would be absolutely nothing in the city code to impede the process. Other precious structures with no protection? The Alabama Hotel. Rogers’ iconic arte moderne Jewett House. Sandscove on Via Tuscany. The 1902 George Wright House, the oldest house in the historic Hannibal Square neighborhood, currently being marketed as a tear-down. The list goes on and on. In Sarasota and many other cities that value preservation, it’s not so easy to demolish a historic home, even one not listed on the local register. Sarasota’s Senior Planner, Dr. Clifford Smith helped draft his city’s ordinance which he says “makes it very difficult to demolish a house on the State Master Site File.” To knock down a historic home, the owner must demonstrate to the city that he or she has explored every potential option for saving the home, including selling to another buyer, remodeling, and relocation. If the board is satisfied that these options have been exhausted, they may grant a demolition permit after a waiting period of 120 days. According to Smith, these regulations make it so difficult to raze a historic home, that in the five years since the policy was written, only a handful of historically significant residences of the 3,500 listed on the Florida Master Site File have been lost. There is a role for private citizens and organizations in historic preservation. 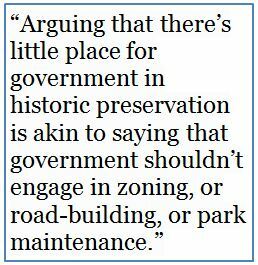 But arguing that there’s little place for government in historic preservation is akin to saying that government shouldn’t engage in zoning, or road-building, or park maintenance—that if the private sector values these things, they’ll happen. We know this not to be the case. Cities around the country that have been successful in preserving their sense of place have one thing in common: a strong preservation ordinance enforced by a city government that values its historic resources. Right now, Winter Park’s Historic Preservation Board has been charged by the City Commission with reviewing the city’s ordinance, and making recommendations to strengthen it. Let’s hope that ambitious enough changes are proposed by the board—and accepted by the commission—to endow the city with the clout necessary to save our architectural heritage. Because assuming the free market and a weak ordinance will adequately protect a city’s character and sense of place will, well…you know what they say about assuming. Of course, the house at 1509 North Orange Avenue hadn’t always looked this way. 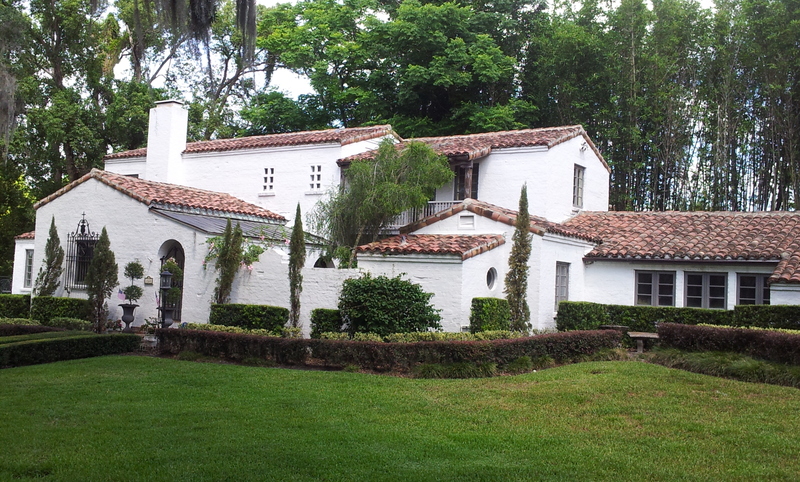 When it was constructed in 1926 for the Babcock Family, the house was a gleaming example of the Spanish eclectic architecture that would become so popular in Central Florida in the years that followed. 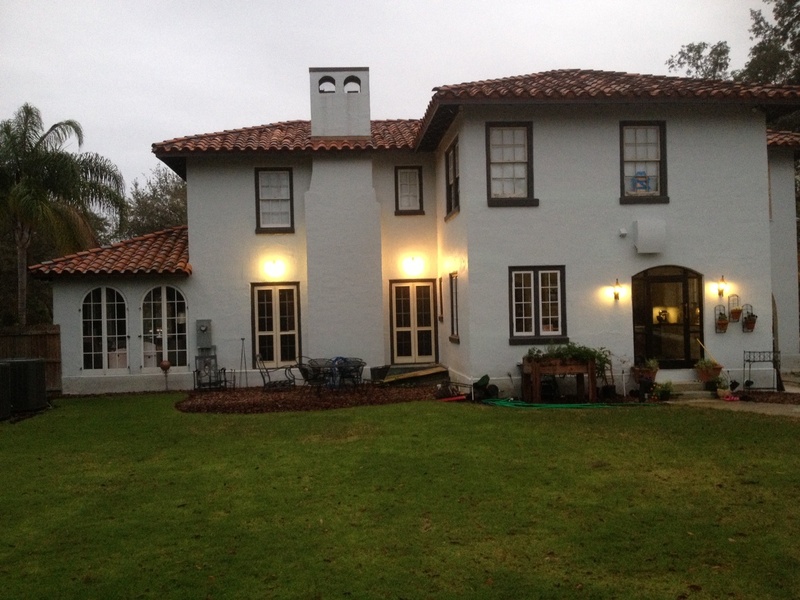 The stucco, barrel-tile roofed structure attracted buyers to the new neighborhood by Walter Rose’s Central Florida Development Company. Orwin Manor—so named because it straddled the border of ORlando and WINter Park–was the first neighborhood in the area built with streetlamps, sidewalks, and a sewer system. The deed to the land specified that the buyer “shall at no time erect any dwelling on the above described premises costing any less than $7,500.00,” a princely sum at the time. The Babcocks’ home did not disappoint—its striking façade was detailed with arched French doors leading to shallow ironwork balconies, rounded arch vents, an asymmetrical recessed entry with decoratively sculpted plasterwork, and a beautiful side Florida room with arched windows. Clearly, this house was built to stop traffic on what was then called “Dixie Highway,” the only two-lane road between the two cities. Through the years, the house was occupied by a series of prominent families, including citrus magnate JM McCord. Yet in recent decades, disrepair overtook the house’s original glory. Sheets of paint peeled from the façade. Overgrown shrubbery and ‘trash trees’ obscured the house’s architectural detailing. Six rusted vehicles cluttered the yard. 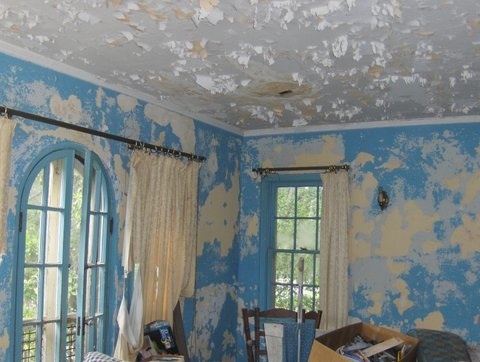 Sheets of paint hung from ceilings, rust-stained from years of roof and plumbing leakage. Floors and windows hadn’t been maintained for decades. The piles of clutter and boxes created a labyrinthine effect, stacked in nearly every room. 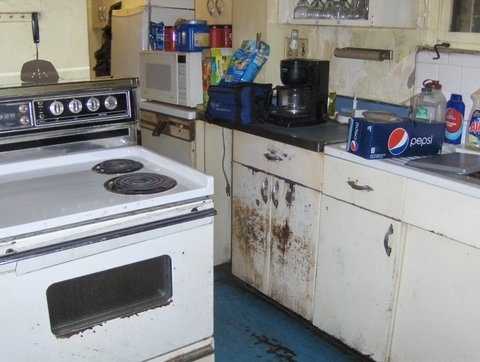 The kitchen was squalid, with rusted cabinets hanging from their hinges. During their visit, the couple counted six cats and four dogs. But the Spencers liked a challenge. They saw beneath the clutter and grime the bones of a structure that would be extremely costly if impossible to rebuild. Plus, Michael, a general contractor and construction manager for SeaWorld, had a lot more know-how than your average homebuyer. They rolled up their sleeves and got to work. The first step was to discern what jobs they should farm out and what they could realistically tackle themselves with their three-year-old daughter, Ava Grace, nipping at their heels. In the former category they put the roof, which was painstakingly repaired—section by section, tiles were removed, subroof replaced, and then tiles reinstalled. 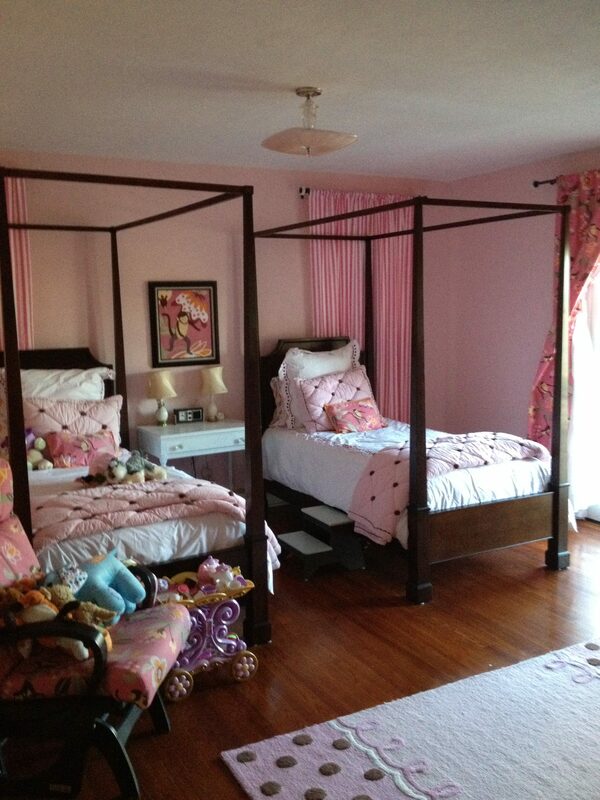 The electric and plumbing systems were completely replaced. The exterior of the house required extensive scraping and repainting. 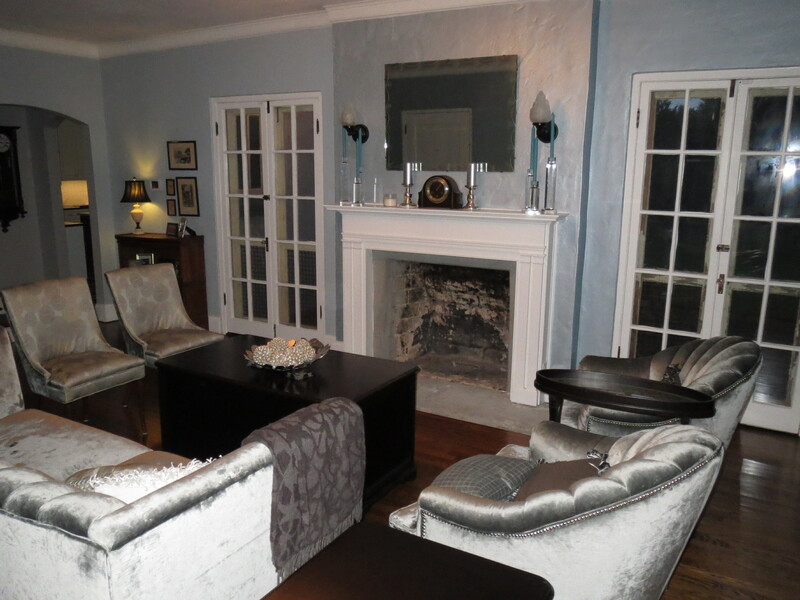 Interior plaster ceilings and walls had to be replaced because of water damage. 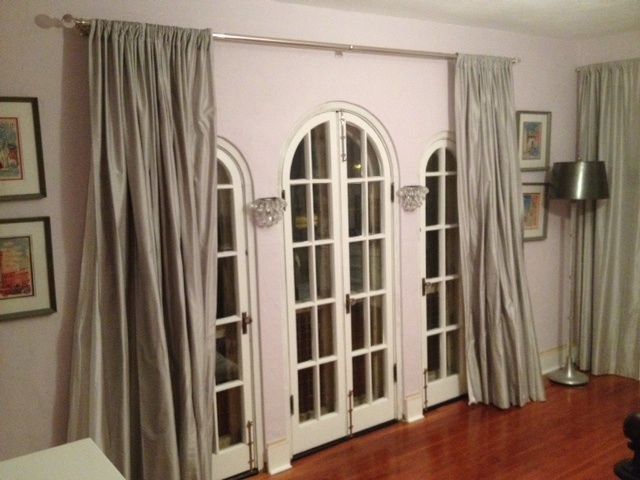 A lot of the work involved a complete restoration of the original doors and windows. The Spencers teamed with CCS Restorations of Sanford for the work. While it might have been easier to replace rather than restore, the quality of the original woodwork was apparent. Though shabby in appearance, the heart cypress sashes had no rot, despite at least 30 years of neglect. Plus, according to Aimee, “new doors and windows rob a historic house of its soul.” The Spencers removed the windows a few at a time, drove them to Sanford, and restored the jambs themselves while CCS tackled the sashes. Seeing the beautifully restored and reinstalled windows and doors, it would be difficult to argue that their labor was unjustified. The soul of the house flourishes. The backyard required a full-scale excavation. When all was said and done, they had hauled 4 dumpsters full of trash from the property. When they thought they were done, they uncovered a Suzuki Samurai hidden in the back yard’s overgrown vegetation. 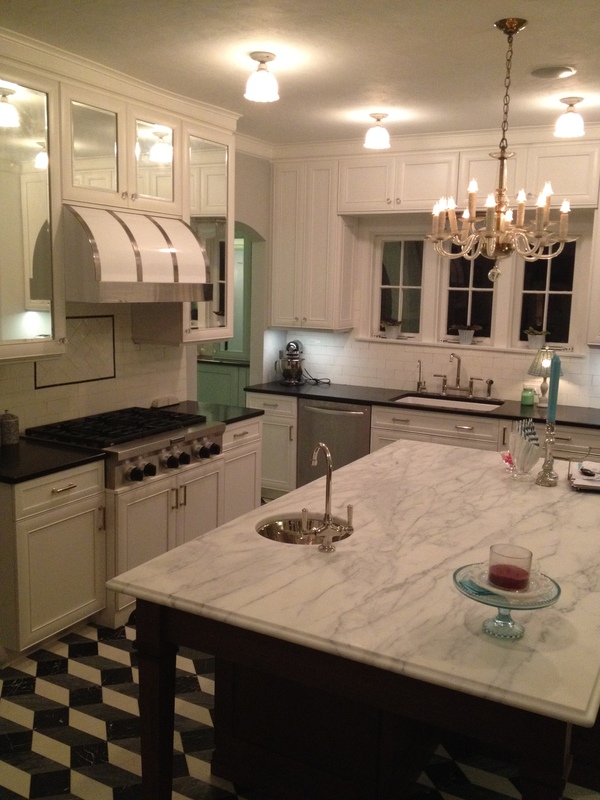 The interior of the house is an anomaly–it retains its historic character while gleaming with newness. 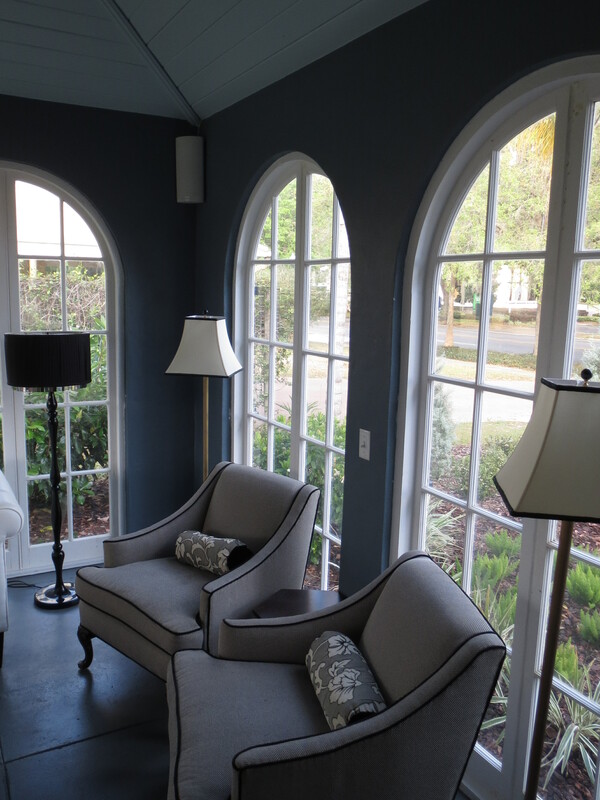 The special Benjamin Moore metallic blue paint shimmers as sun streams in through the French doors. Although many of the fixtures in the bathrooms and kitchen are new, the Spencers took care to choose things that were period-appropriate. 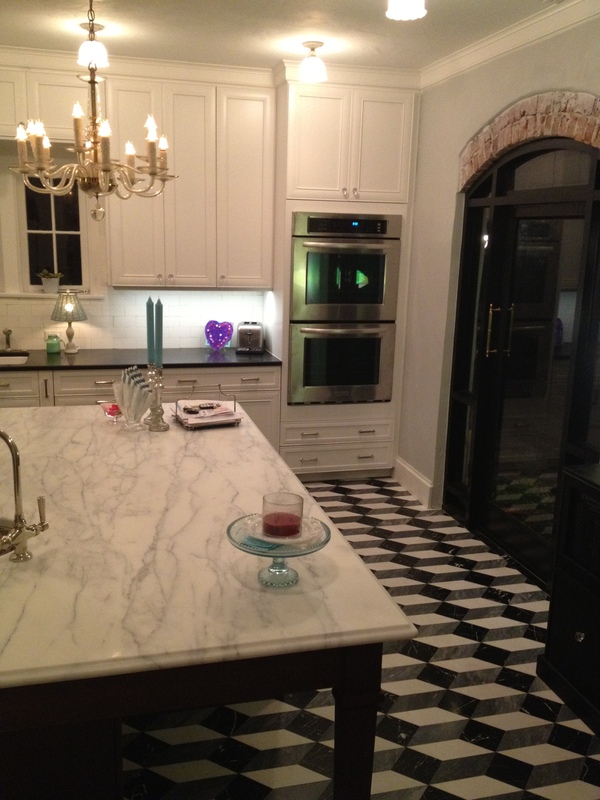 They were also able to reuse the ‘subway’ tile from the original bathrooms for the butler’s pantry and backsplashes. And although the Spencers “intend to be repainting this house when (they’re) 80,” the rehab has made financial sense as well. Purchased for $275,000, after complete renovations the couple will have invested less than $200 per square foot for a house with all new mechanical, electrical and plumbing systems, insulation, waterproof membrane and original tile roof, and refinished or new finished in place hardwoods. The estimate even includes the cost of a future swimming pool and fenced backyard. 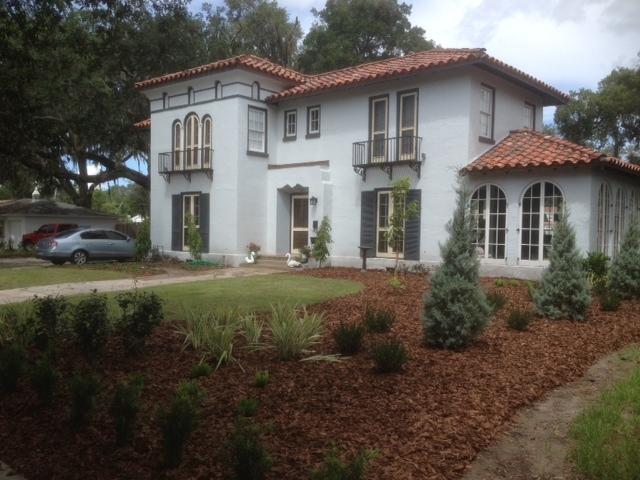 Looking ahead, Aimee plans to become more active in historic preservation in Winter Park. “I hope the city will start to put a higher priority on protecting historic houses. We need a stronger ordinance, and better incentives for people to have their houses listed.” She serves on the Friends of Casa Feliz’s advocacy committee, and is eager to share with Winter Park some of the preservation successes she witnessed during her years in Orlando and West Palm Beach. Meanwhile, there’s more crown molding that needs to be painted, and some screens to repair. The Phoenix has risen, but he needs to be fed. 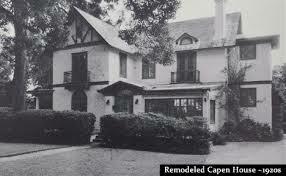 The Friends of Casa Feliz are delighted to announce that the Preservation Capen Movement is off and running! The last two weeks have brought some terrific developments in the project to save the Capen-Showalter House by moving the 1885 structure from its current location, by barge, to the beautiful grounds of the Albin Polasek Museum and Sculpture Gardens. Community Leadership Joins Crusade: Leading the charge is an All-Star Team of community leaders, including Lawson Lamar, Thaddeus Seymour, Jack Miles, Barbara DeVane, Ann Hicks Murrah, Chip Weston, Pat Robertson, Stephen Pategas, and 50 years of Winter Park Mayors: David Strong, Kip Marchman, Gary Brewer, Dan Hunter, David Johnston, Allen Trovillion, Terry Hotard and Joe Terranova. Noted Preservationist To Lead Project: Christine Madrid French has signed on as project director for Preservation Capen. An architectural historian, Chris brings a wealth of experience to the project. Her professional experience includes directing the Modernism + Recent Past program for the National Trust for Historic Preservation and directing projects for the National Park Service, the City of Philadelphia and the University of Virginia. She can be reached at preservationcapen@polasek.org. File under ‘S’ for ‘Serendipity’: Museum offi­cials recently dis­cov­ered that the Capen-Showalter House and the Albin Polasek Museum & Sculp­ture Gar­dens are linked by friend­ship and fam­ily ties! Albin Polasek’s closest friends were Percy and Charlotte Capen Eckhart, whose children he immortalized in his art. The museum’s beloved “Elizabeth” sculpture features the Eckharts’ daughter, who is James Seymour Capen’s niece! The sculptor and his subject are shown at right. Next week, the museum will host Capen descendents Melissa Capen Rolston of Kansas City, Missouri, and Ann Capen Hunt of Eads, Tennessee, for the grand kickoff of Preservation Capen. What a thrill it will be to reunite the Capen and Polasek families! In the meantime, please consider making a donation to this important community-wide effort to preserve one of Winter Park’s most historic homes. Make your contribution here: http://www.polasek.org/donate-to-keep-the-capen/.